We love Weddings. You will love what we can do for yours. As long as you do not get married on the 4th of July (Like I actually did), FE can do great things for your wedding. We can spend the time to develop something for you that is simple and inexpensive or elaborate and choreographed. All permits and insurance are handled by Fireworks Extravaganza. We can shoot indoor effects on tables, or above the dance floor. We can match the colors of your wedding dresses in a volley of shells above the site. Outdoors we can shoot any size display, but it is dictated by the amount of room that you have. However, even if you have less space, we can so something amazing. We just need 75' of space. We can use pattern shells that are Hearts, Faces (Ladies, Men's and Children), Cubes, Stars, Circles, If there enough lead time we can even make your initials in the sky in a shell. astly as long as it is not on the 4th of july, we can spend the time and choreograph your show to music. The display will be timed to 1/1000 of second to the music. 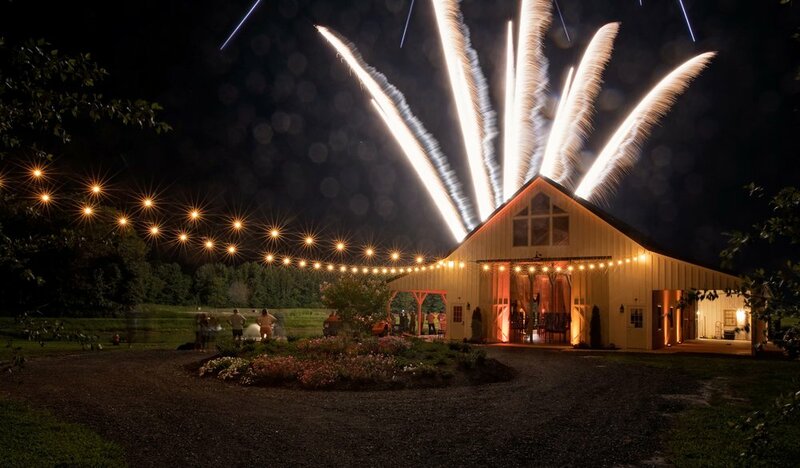 Imagine dancing your first dance under truly magnificent stars and effects all while choreographed. "Tony and I want to THANK YOU for all of the hard work you put into the fireworks for our wedding. They were by far, the biggest hit of the entire night! From the beginning, you both were so easy to work with and so patient in answering all my questions. Especially when it took a little long for us to work out the details and sign the deal! Your passion and excitement for fireworks comes through over the phone and I couldn't help but get more and more excited every time we talked. I really appreciated your professionalism and willingness to work within our budget. I also want to thank you for working with The Farmhouse to take care of timing and logistics. With so much going on before the wedding, I was so relieved that you were able to directly handle everything with the venue, permitting, insurance, etc. The fireworks were a SHOWSTOPPER. 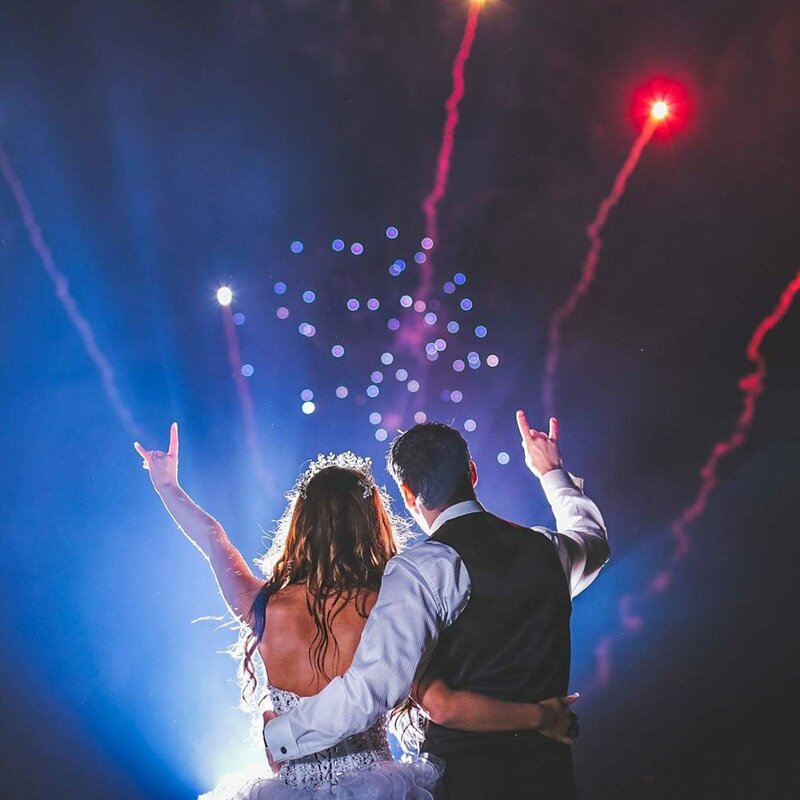 Everything about our wedding was perfect, but the fireworks really put it over the top. Tony and I couldn't believe how amazing they were and it was worth every penny! Here are some pictures from our wedding (above) We'll never forget this moment!" Wedding at Oheka Castle in Huntington NY. CLICK PHOTO to watch video of a Proximate display.